Having a reliable way of keeping track of your blog visitor data is important to help your blog grow. 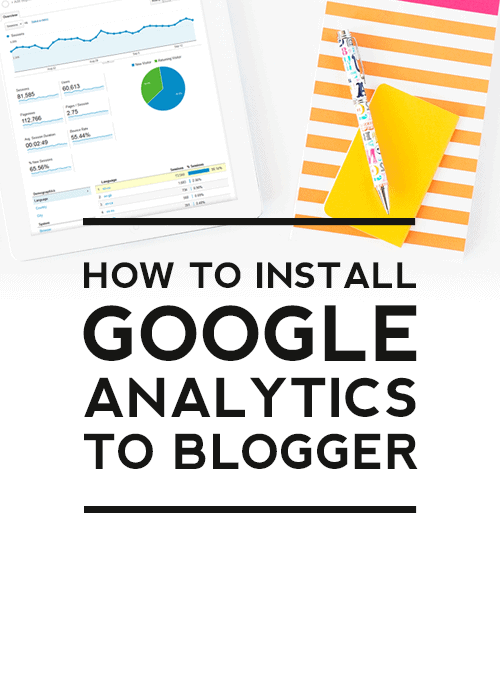 Installing Google Analytics to your Blogger blog is the best way to keep an eye on important visitor data related to your blog. Google Analytics can show you real-time data such as your page visits, the demographics of your blog visitors, your bounce rate, your referrals, where your visitors spend time on your blog, and numerous other important data that will help give an idea of the audience of your blog. Step 1. Sign up for a Google Analytics account. Sign in to your Gmail account and go to www.google.com/analytics and click on the Sign In link in the upper corner and choose Analytics from the drop-down menu to sign up. On the next page click on the Sign-up link. Fill in the sign-up form for a new account with your account name, website name, website URL, industry category, and time zone. Step 2. Find the tracking ID for your account. After you sign up for an account, the next page should show your tracking ID. It should be in the following format: UA followed by a dash and numbers. Step 3. Install your tracking ID to your Blogger blog. Sign in to your Blogger account for your Blogger blog. On the lefthand side of your Blogger dashboard, click on Settings -> Other. Under Google Analytics, copy and paste in your Analytics tracking ID from step 2. Click on Save settings to save your recent change to your blog. Google says it can take up to 24 hours for your blog data to show in your Analytics account. The amount of data Google Analytics shows about your blog can feel overwhelming. We have an in-depth two-part series that breaks down how to read your blog stats to get the most out Google Analytics for your blog. If you have any questions, please feel free to leave them in the comments section and we will answer them as soon as possible.